Not all relationships are created equal. Engaging in a friendship relationship is different than a romantic relationship, which is distinct from a parental relationship. Unfortunately, our prior relationships rarely prepare us for caregiving because it is unlike any other kind of relationship we’ve experienced. If you’ve ever felt unprepared for your caregiving relationship, it may be because . 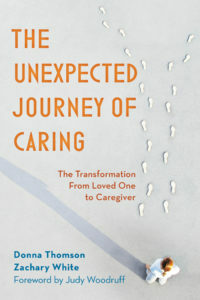 . .
Caregiving Relationships Don’t Have Clear Beginnings. Most other types of relationships encourage clear beginning stories. These “I’ll never forget the first time we met” narratives are essential because they remind participants of their common history in ways that strengthens their commitment to one another. For caregivers, origin stories are not encouraged because others don’t want to hear when our care relationship began, they want to hear about when it might end. So our care beginnings can become blurred over in ambiguity and confusion: When exactly did your care begin? It’s oftentimes hard to discern, isn’t it? Was it with the first doctor visit? Or did it begin when your loved one talked about her pain months, or even years, in advance of an official diagnosis? Amidst this confusion, we don’t give ourselves permission to indulge in an origin story that might capture and reinforce the unique bond of our caregiving relationship. Caregiving Complicates our Understanding of Relational Choice. In almost all relationships other than family, participants are believed to act on choice. When a relationship dissolves, it’s because of choice—a recognition that the reasons to be together are less than the reasons to be apart. Caregiving, on the other hand, isn’t all about choice because a relationship defined by care means that need, obligation and challenge can’t be untangled from the discernible threads of love, opportunity, and willingness. We don’t seek out caregiving relationships, they come to us as both parties are called to become something other than they had imagined—clearly, no one wants to be ill nor does anyone dream of the perfect caregiving relationship in the same way they might idealize a perfect friend or life partner. Bonding Over the Future May Not Be Possible. Most others’ relationships are intensified by talking and dreaming out loud about the future—“I can’t wait until we get away for our one-year anniversary”—to bring them closer together in the present. For caregiving relationships, both parties must seek to establish ongoing connection without the future as a crutch. It’s no surprise that when the intoxicating language of the future tense is stripped away, the caregiving relationship itself is filled with anxiety and uncertainty. Caregiving Relationships are Not One-Dimensional. Using the one-dimensional label of ‘caregiver’ to account for all care-inspired relationships denies the diversity of our care experiences—acute, chronic, in-person, long-distance, mother, father, sibling, alone, familial, amicable, antagonistic—and also makes it more difficult for us to express our experiences. Everyone recognizes both the joys and challenges of friendship and romantic relationships—the inevitable ups and downs, tensions and joys, frustrations and thrills, fears and possibilities. Unfortunately, caregiver relationships aren’t given the same freedom, so our relational realities of laughter and sadness and life-altering appreciation and mourning and connection and isolation can’t help but be misunderstood. Mapping the terrain of our care-inspired relationships is so important because it allows us to speak to our experiences beyond the I and into a we where strength and support comes from knowing our path is not to be experienced in the darkness of mystery and isolation. It’s way past due for our care-inspired relationships to come out of the darkness and into the light of understanding as we are called to these most precious of relationships when we least expect them.